George Edmund Bigge was born in Grayling, Michigan and earned a doctorate in economics from the University of Michigan. He taught economics at Brown University as was the Chairman of the Department of Economics before coming to the Social Security Board. Immediately after the end of World War II he served a brief stint as Adviser on Social Security to the U.S. military government in Germany. Following the dissolution of the Social Security Board in 1946 Bigge remained with the Federal Security Agency, and its successor organization, the Department of Health, Education and Welfare. At the creation of HEW in 1953, President Eisenhower elevated him to the position of Assistant Secretary for Federal-State Relations. 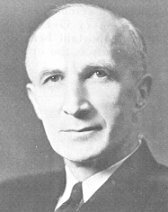 In 1957 he was appointed as Special Assistant to HEW Secretary Arthur S. Flemming, a position he help until his retirement from government in 1959. Mr. Bigge died in Bethesda, Maryland in 1977.